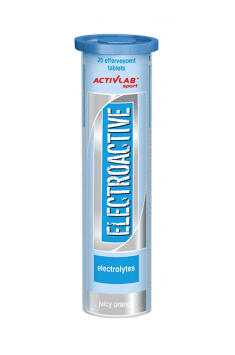 Activlab Electroactive is a preparation contained in water soluble effervescent tablets containing the most important electrolytes of the human body, including sodium, potassium, chloride, calcium and magnesium. Electrolytes play many different roles in the body. They participate in the transmission of electrical impulses along cellular membranes in neurons and muscles, help stabilize protein structures in enzymes, take part in the release of hormones from the endocrine glands and influence the osmotic balance that controls the movement of water between cells and their environment. Sodium is the main cation in extracellular fluid, which is responsible for the osmotic pressure gradient between the interior of the cells and the surrounding environment. It also plays a key role in muscular and neuronal excitability. Sodium levels are regulated rigorously by renal functions. Hyponatremia, which is too low a sodium concentration, is usually associated with excessive accumulation of water in the body, as well as loss of sodium, which may result from a reduction in the amount of ions combined with continuous excretion in the urine, excessive sweating, vomiting, diarrhoea, taking diuretics, as well as excessive urine production, which often accompanies diabetes. Potassium is the main intracellular cation that participates in determining the resting potential of the membrane in neurons and muscle fibres after membrane depolarization and passing the nerve impulse. Unlike sodium, potassium has a very small effect on osmotic pressure. The recommended daily intake of potassium is 4700 mg. Hypokalaemia is too low a level of potassium in the blood, which usually results from limited intake of this element or because of vomiting or diarrhoea. Potassium deficiency is manifested by muscle weakness, flaccid paralysis and cardiac arrhythmia. Chlorine is the dominant extracellular anion. Chlorides are the main factor influencing the gradient of osmotic pressure between intracellular fluid (ICF) and extracellular fluid (ECF), and therefore play an important role in maintaining proper hydration. Lowering blood chloride levels may occur due to vomiting, diarrhoea and metabolic acidosis. Most of calcium in the body is contained in bone tissue, ensuring its hardness and serving as a reservoir of this element for the rest of the tissues. Just over half the calcium in the blood is bound to proteins, leaving the rest in ionized form (Ca2 +), which is involved in muscle contraction, enzyme activity and blood clotting. In addition, calcium helps stabilize cell membranes and is essential for the release of neurotransmitters from neurons and hormones from the endocrine glands. Calcium is absorbed by intestines under the influence of active vitamin D. Vitamin D deficiency leads to decreased calcium absorption and eventually depletion of calcium deposits in the skeletal system, potentially leading to rickets in children and osteoporosis in adults. If the calcium level falls below the normal level, both muscles and nerves become more excitable. Magnesium contributes to proper functioning of the sodium-potassium pump, acts as a cofactor for many enzymes, participates in proper muscle contraction and conducts action potentials. In addition it regulates activity of parathyroid hormone and therefore plays a major role in calcium metabolism. Its proper level can be of paramount importance in maintaining healthy bone mineral density. Due to low intake and poor absorption of this element, its supplementation is recommended. It is worth bearing in mind that prolonged stress, physical and mental strain, intense lifestyle, as well as consumption of large amounts of stimulants, including coffee and alcohol, increase the demand for magnesium. In summary, Activlab Electroactive is a dietary supplement whose action is much broader than just supporting physical effort. This supplement is a perfect remedy for possible deficiencies of the most important electrolytes lost along with sweat during workouts and hot weather. It is also ideal in situations when we suffer from various ailments that cause persistent vomiting and diarrhoea. bardzo fajny i wygodny produkt! Serve one portion of the product (2 tablets) dissolved in water during breaks between workouts or directly after workout. It is recommended to use the supplement when performing intense physical labor, during extreme heat, diarrhea or vomiting. A minimum of one portion (2 tablets) dissolved in water, depending on the severity of the loss. A portion (2 tablets) in case of exposure to electrolyte deficiency caused by high ambient temperatures, persistent diarrhea or vomiting, the supplement should be consumed at a dose of covering demand and leveling deficiencies. Oftenthe daily dosage recommended by the manufacturer may exceed one serving (2 tablets) and everything is subject to loss of water and electrolytes. Persistent diarrhea / vomiting it might be suggested to drink three or more portions per day. In the case of high ambient temperature (heat, work under the hot microclimate), it seems reasonable to drink a minimum of 2 servings per day. Acid regulators: citric acid, sodium bicarbonate, potassium bicarbonate, malic acid; fillers: sorbitol, glucose; aroma, carrier of sweeteners: polyethylene glycol; sweeteners: acesulfame K, sucralose; color: brilliant blue.